High school graduation rates are up. Should we thank Obama? How much credit should we give to President Obama’s education policies? 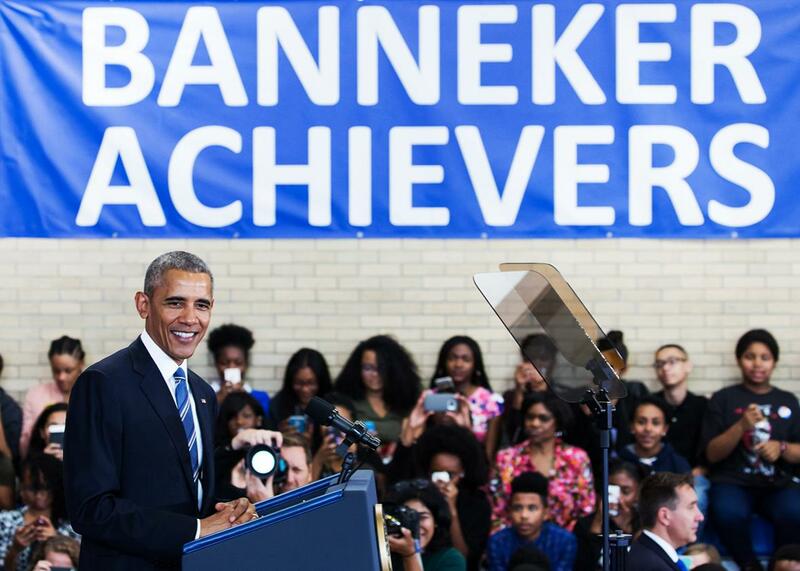 President Barack Obama delivers remarks on education at Benjamin Banneker High School in Washington, D.C., on Monday. It’s true that the news is good. Over the past four years, graduation rates increased by 4.2 percent for all students and by even more for groups such as black students (an increase of 7.6 percent), English learners (8.1 percent), and low-income students (6.1 percent). While there are still significant racial and socioeconomic gaps in high school graduation rates, those gaps have shrunk, with black, Latino, and Native American students beginning to catch up to their white peers. Though many states continue to have low standards for earning a diploma, it’s still important that as many teenagers as possible finish high school. Those who graduate are less likely to be unemployed and earn more than those who drop out, even if they do not go on to college. But it’s difficult to determine which factors are truly responsible for this progress, and to what extent President Obama can take credit for them. I spoke to Jonathan Zaff, executive director of the Center for Promise, the research arm of America’s Promise Alliance—a nonprofit founded by Colin Powell and his wife, Alma, to raise high school graduation rates. (Powell was in the audience for Obama’s speech Monday.) Zaff believes that the school accountability efforts of presidents George H.W. Bush, Bill Clinton, George W. Bush, and Obama all played a role in increasing graduation rates. Each president encouraged states to test students more frequently, and to track test scores and school attendance patterns over time. No Child Left Behind was a widely ridiculed law that almost certainly narrowed the curriculum to the information tested on annual math and reading exams. But one of its positive effects was more data that allowed educators to see how many middle-school children displayed the risk factors for later dropping out. Those signs include failing scores in math and English, and being absent on more than 20 percent of school days. In a paper published in March, Zaff and several colleagues examined the types of education reforms that have been successful in helping at-risk students complete high school. They identified some factors Obama mentioned in his Monday speech, such as warm relationships between teachers and students, and many he did not, such as expanding access to afterschool and summer programs and making greater efforts to get parents involved in their children’s education. Curiously, Obama also did not talk about K-12 school funding on Monday, even though he has a lot to be proud of. Higher per-pupil funding is associated with large increases in graduation rates, and the administration can take credit for using the 2009 stimulus bill to help local schools make up for state-level budget cuts. What’s more, many of the reasons for the increase in the high school graduation rate lie outside public school doors. To understand why, it helps to take the long view. At the turn of the 20th century, high school was an elite place where the 10 percent of Americans who were expected to attend college studied Latin and other esoteric subjects. That began to change during the Progressive Era, when education reformers pushed high schools to offer curricular tracking with vocational courses and lower-level academics. Still, as recently as 1940, only about half of Americans graduated. Families expected their teenagers to work, and fewer boys needed a degree when there were abundant, well-paid jobs in the manufacturing sector. After World War II, the graduation rate increased quickly, reaching its previous peak of 77 percent in 1970. It then stayed stuck there for three decades. In the early years of the new millennium—well before President Obama entered the White House—the graduation rate began to rise again. In a 2013 paper, Richard Murname, an economist at the Harvard Graduate School of Education, tried to figure out why the graduation rate was frozen for so long, and why things improved around the year 2000. He attributed the stagnant graduation rate between 1970 and 2000 to several causes: an increase in the percentage of high-school students who were black and Hispanic, and who graduate at lower rates than white students; the increased availability of the GED as an alternative qualification; and the birth of the school standards movement, which required students to pass more difficult exams in order to graduate, leading some students to fail and drop out. Around the year 2000, the graduation rate began to improve steadily, with Hispanic and black students seeing the most growth. Why? Murnane identified a host of factors that predate Obama’s term in office, and have more to do with giant social and cultural changes than narrow education reform policies. The teen birth rate has plummeted, which helps those teens who might have had children stay in school; older parents are also better prepared to help their kids succeed academically. Juvenile arrest and incarceration rates have declined by half since the mid-1990s, and contact with the criminal justice system is highly correlated with dropping out. Obama said in his Monday speech that high school graduation “starts with our youngest learners,” and touted his administration’s investments in Head Start and other public pre-K programs. No child who attended pre-K over the past seven years is yet old enough to have finished high school. But a longer-term increase in preschool attendance is undoubtedly part of the story of why high school graduation rates have gone up. Better early childhood education is one of the most cost-effective ways to help children go on to earn a diploma. That’s why, if the United States is to achieve the high school graduation goal President Obama set when he entered office—to be No. 1 in the world by 2020—we will have to match other developed nations in the opportunities we provide to children under age 5. Currently, as many as half of American 4-year-olds are not enrolled in pre-K. Parents are spending nearly a third of their income on child care for babies and toddlers, and that care is often subpar. Hillary Clinton’s boldest policy proposals are those to vastly increase access to affordable, high-quality child care and preschool, which will help children develop cognitive skills. If she is elected and able to enact these plans, the high school graduation rate may continue to climb—regardless of how successful President Obama’s more controversial school reform priorities, like teacher accountability and the Common Core, turn out to be.